Covergirl Clump Crusher Mascara:: I only got this about a week ago, but it has quickly become one of my favorite mascaras ever. I love mascaras that give a lot length and definition with very little clumping and hassle. This one does just that! The brush comes out of the tube super clean with almost no extra product on it, so you can throw it on quickly and it looks great. The brush also has hard plastic bristles, which tend to be my favorite kind. I hate having to work and work at my lashes to get them how I want, this mascara is super low maintenance. I'm so siked to have picked this product up at CVS and have been using it daily! Benefit Hello Flawless Face Powder:: This is the first legit face powder that I have used. I use my Maybelline translucent mattifying powder all the time, but this Benefit powder has actual pigmentation to it-so it's very different. I have been loving this product this month because it creates a really flawless (hence the name), airbrush effect. After applying foundation, I used a Beauty Blender sponge to apply this mainly to the T zone and it smooths out pours and imperfections. It also gives a nice, matte finish which I prefer for the colder months. Maybelline Dream Lumi Touch Concealer:: I did a blog post already raving about this product and it is most definitely a favorite of the month. I have been using this concealer every single day and have zero complaints. It works just as well if not better than my very pricey Bobbi Brown concealer and it is less heavy because it is a liquid instead of a cream. It conceals and highlights the troublesome under-eye area beautifully and is definitely a daily necessity for me! 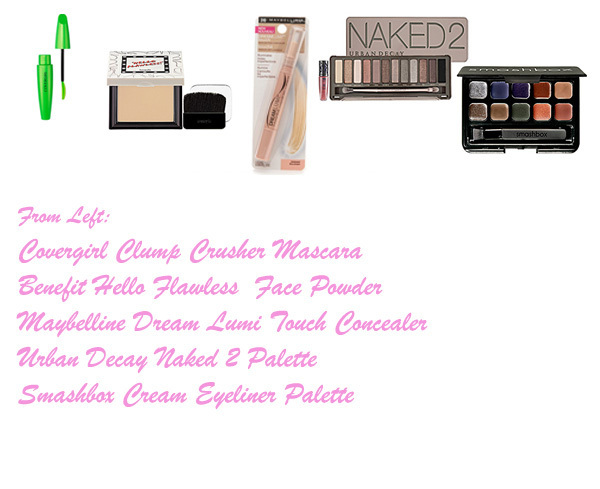 Urban Decay Naked 2 Palette:: I longed for this product forever before I finally took the plunge and purchased it. I'm not sure what it is, but something about this palette makes me happy every time I use it. The colors are super wearable and I have been using them often for work makeup. You can create the perfect, understated brown smokey eye, or just give your lids a wash of color. It also comes with a brush that is surprisingly nice and I actually use it almost everytime I use the palette (usually brushes that come with products are crappy). I love the packaging in general, its a metal-ish container that clicks closed. This is an October favorite because it has been easy and fool-proof go to for me in the mornings before work. Smashbox Cream Eye liner Palette:: This is a favorite for me this month because I have been using the brown and deep blue color a lot for upper lid eyeliner. Applying a color to the lid and then sweeping on some of this cream eyeliner makes for an easy, but put-together look. Using blue and brown instead is a nice change instead of always using black.